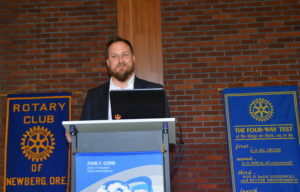 We covered a lot of ground at our meeting last week….inducted a new member, heard a Classification Talk, learned about upcoming service opportunities and events, were asked to participate in a community diaper drive– and our meeting even coincided with the International Day of Peace, which has been a focus of the club’s Peace Committee. Whew. A full agenda. Mike Pollock smiles after induction to our club. 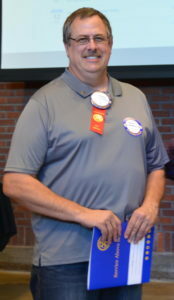 Mike Pollock was welcomed as our newest member. 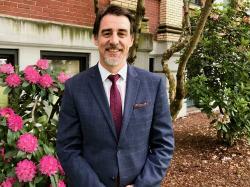 Mike is the Yamhill County Program Director for Helping Hands. This organization is a multi-county, regional organization which has evolved from operating one safe house in 2004 to operating 8 re-entry homes and a homeless relief center. I think some of us feel like we already know Mike, as he has been attending our meetings regularly for awhile. However, we didn’t know his hobby is fishing! Welcome to our club, Mike. 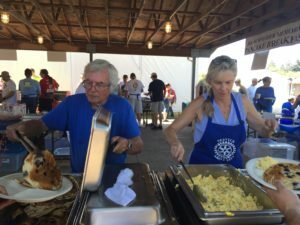 Two visiting Rotarians joined us: Alan Evans from the Seaside Club and from the Tigard Club, Andrea Johnson (who is also Judy Robinson’s daughter). Guests included Corbin Day, Kathy Sims, Howie Harkema and Marvin Robinson (Judy’s husband). Judy Robinson giving her Classification Talk. Isn’t it wonderful that Judy’s husband and one of her daughters were there to support her as she gave her Classification Talk? Really nice. 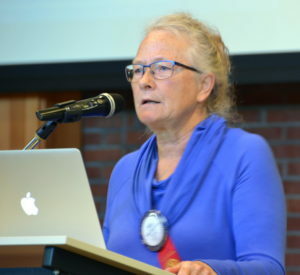 Judy Robinson told us that her family is the reason she is the person she is today. Her daughter Andrea was already a Rotarian and encouraged Judy to look into Rotary after her retirement. 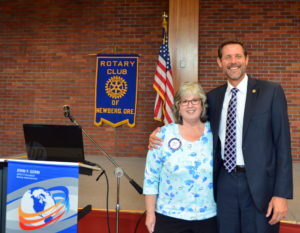 She also joined Rotary as a way to fulfill her own personal goals. 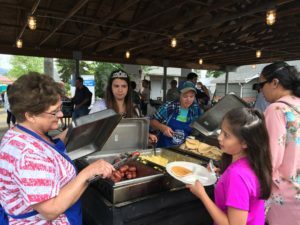 She told us about her three kids: Andrea and husband Mark, who like to bike; Jerene and husband Shawn, who are into hunting; and son Michael and wife Michelle, and her two grandkids. She has been in Newberg awhile, as she worked at Friendsview in the 1980’s, and all her kids graduated from Newberg High School. She said she is quite fond of Newberg, but then she shared what she was really passionate about: advocating for the needy and vulnerable in our society, and finding options to relieve chronic pain. 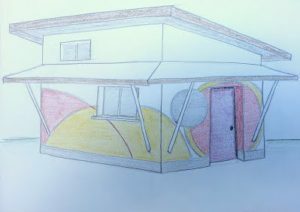 To help the needy, Judy started buying properties to provide “clean, well-kept, decent homes.” That, in turn, led her to explore financing and finding ways to lend money to needy people by collaborating with private lenders. She has more exciting projects in the works to “build something socially responsible” and to help the needy population with health care. We hope she’ll keep us updated. She closed with, ” Keep moving, keep giving, keep laughing, keep thriving, keep caring.” Great advice, Judy! UPCOMING EVENTS–Please mark your calendars! Oct. 12 We will NOT have a regular meeting, but instead have a social activity at 5pm. Location TBD. And Om Sukheenai mentioned her upcoming Customer Appreciation Night and 15th Anniversary Party on Thursday, Oct. 13 from 5 to 7:30pm at the Chehalem Cultural Center. Please RSVP directly to Om. UPCOMING SERVICE OPPORTUNITIES–Please consider signing up! Help put together gifts bags for kids for the Holiday Tree Lighting ceremony, or better yet, be Santa for the kids! President Leah asked us all to please bring some disposable diapers to our meeting this week to help out A Family Place, the only nonprofit in Yamhill County that provides free diapers to women in need. According to their website, “even though they limit the number each family can request, they still distribute thousands each month.” They have asked for the community’s help to rebuild their supply. A big thank you to all our members who helped spread the word about, and did a kind thing, on “Acts of Kindness Day” September 21 to celebrate the International Day of Peace. 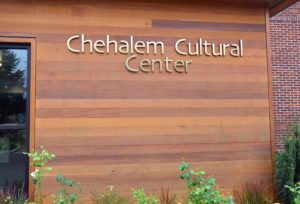 Wednesday, the 14th, we enjoyed the hospitality of Friendsview, as our new home, the Chehalem Cultural Center, was hosting a job fair, which I heard was pretty successful. Stan Kern brought along four young men from George Fox Serve Day. He thought he was just driving them to their worksite to help out a widow with lawn work, but you know Stan, he got right in there and worked alongside them. Serve Day also had groups at Avemere cleaning wheelchairs and walkers, Friendsview helping with physical therapy, the Library cleaning, and all over town doing a variety of things to improve our community. Thanks George Fox. Michael Pollock, who’ll be inducted next week, joined us for the last time as a guest. Next week, Wednesday the 21st, is Peace Day and Rotarians are encouraged to participate in the Act of Kindness Day. The Early Birds are having their 5th annual Oktoberfest this weekend (16-17) in Memorial Park. Volunteer or attend this event that is a fundraiser for their international projects. It was Jim McMaster’s 61st Birthday (he’s the one who announced it) and apparently residents of Friendsview are wondering when he’s moving in! October 12th, we won’t be having a lunch meeting as that is A Family Place’s fundraiser during our normal meeting time/place. BUT… we are planning an afterwork “fireside/social”. Mike Boock and Grant Austin are working on the details, but mark your calendar for an afterwork event on October 12th. Our program today was the Learning Garden at PCC. 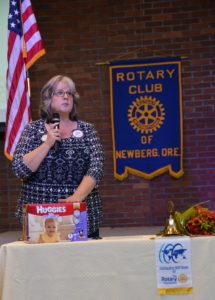 Rotarian Lynn Montoya Quinn, head of PCC Newberg, arranged for the program. She wasn’t able to join us in person, but shared her welcome via power point. 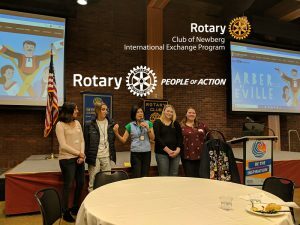 Student Michael Miller (son of Early Bird Rotarian Dave Miller) started off sharing how the PCC Newberg Center is adding a Learning Garden to be used for a lab for environmental classes as well as growing food for students and the community. One of the things they are doing is building a storage shed in a sustainable fashion. Briar Schoon is the PCC Sustainability Officer and she related that PCC has a real focus on sustainability and the PCC campus is Leed certified. Bernhard Masterson, is the PCC faculty member that is leading Michael and students and community members in building a sustainable storage shed. They are doing it with cob building, which isn’t building with corn cobs! It’s a welsh word and it is basically building with clay, straw and even a bit of horse manure! 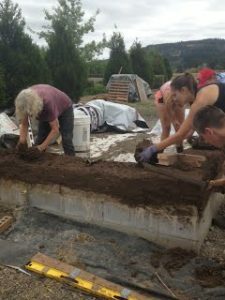 The storage shed at the Newberg campus started this summer with a good foundation of cement blocks, and then the clay and straw building process starts which is pretty much just piling up mud, kind of like playing with mud pies. That’s one of the advantages of cob building as it doesn’t take a lot of training to get people building. The shed is built with a good roof and deep overhangs and that keeps the rain off and lets this mud building survive Oregon’s wet winters. They’ve just started building and will hopefully finish the shed next summer. It’s an amazing process to build. Here in Oregon, you can build a small shed with cob as it doesn’t meet earthquake requirements, however, Bernhard showed pictures of cities with 10 story buildings made from mud. Bernhard teaches natural building at PCC Rock Creek and got into the field as an clay artist and you can see his artistry in the designs of his various builds. 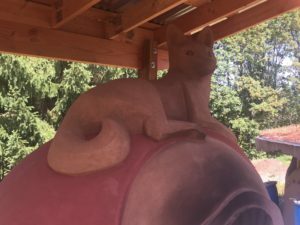 It was a very intriguing program and it will be great to see this cob shed in person at PCC Newberg. 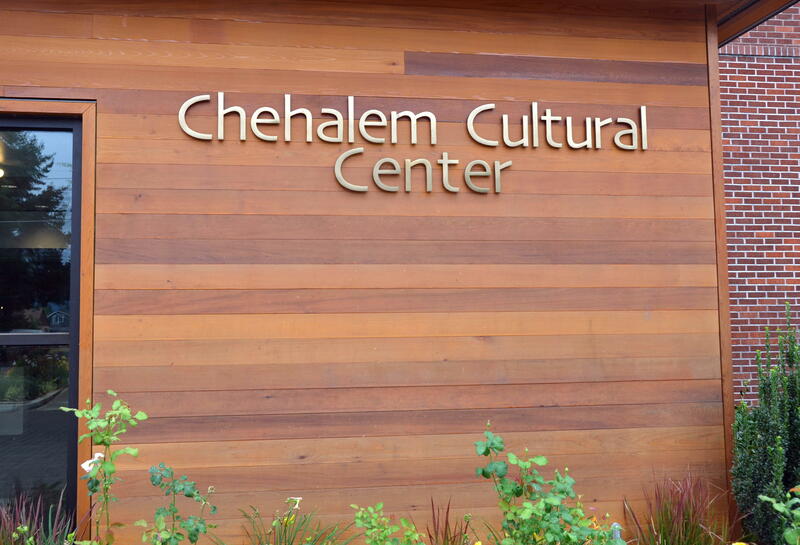 Thanks to the vision and hard work of many in our community, Newberg has a jewel of a facility that many smaller cities would just love to have…..the Chehalem Cultural Center. And if things go smoothly, the full buildout of the Center will be completed in 2020– on the 20th anniversary of the plan that got the ball rolling for this impressive facility in the first place. Rob Dailey tells us about the Cultural Center. We learned about the Center’s history, transformation from a former school, and future plans from an informative presentation last Wednesday by Rob Dailey, executive director of the Center. From 1935 to 1995, the building served as the Central School. It was originally built as a WPA project during the Depression, and the cost to build it back then was $50,000. After 60 years, however, it was becoming outdated, and was damaged in the earthquake of 1993. In the year 2000, the City of Newberg was putting together its “2020” plan. One of the ideas to come out of that process was a cultural arts center. The Chehalem Park and Recreation District (CPRD) had earlier purchased the facility for $1, and secured $1 million in federal money for seismic and other upgrades. CPRD partnered with community leaders to explore the idea of a center. In 2005, a nonprofit was created and fundraising began in earnest. “We can’t thank people like Loni Parrish and the Austin family enough,” for their early donations, said Rob. The Ford Family Foundation funded an independent feasibility study in 2006, and made a major donation of $400,ooo to really kick things off. Through a combination of funding mechanisms, the first phase of construction– with exhibition galleries, meeting rooms and the formation of a Cultural District– was completed in 2013 at a cost of $3 million. 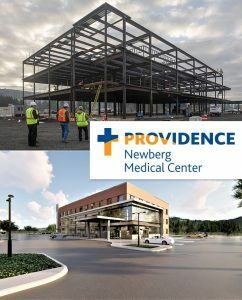 Completed in August, 2014, the second phase included the completion of the 5200- square- foot ballroom and the entry lobby. “We are quite proud of the use of reclaimed wood in the building. It’s beautiful, and it recognizes the historical significance and character of the building,” he said. Rob said this phase was funded through private donations and CPRD only. Some exciting things are in the works! Rob told us about…. …..a 240-seat theater which would allow for live theater performances, dances, concerts, and recitals. ….the creation of a grand lobby with a central staircase to unite the upper and lower spaces. ….A downstairs kitchen/future culinary arts studio. Funding for phase 3 is estimated at $4 to $6.3 million. A funding strategy has been developed, and a public announcement of the capital campaign will be coming soon. Rob also told us about the Center’s logo, which is like a square rainbow. Red represents “the Arts.” There are five galleries at the Center and they feature both national and emerging artists. Purple is for “Heritage.” The Center has many exhibitions and festivals developed around history and culture. Blue is for “Education” –a wide variety of adult and youth classes, etc. Green means “Community.” More than 25,000 visitors came through the Center in 2015, and already there have been over 30,000 this year. Michael Pollock, who should qualify as a new member any minute now! To celebrate the United Nations’ International Day of Peace, our club’s Peacebuilder Committee has partnered with George Fox University’s Center for Peace and Justice, Peace Village Newberg and the Newberg Peace Coalition to sponsor an “Acts of Kindness” Day on Sept. 21. Through social media, posters, fliers, buttons, bookmarks and media coverage, everyone in town is being asked to do something extra-nice for someone on that Wednesday. It has been a tough summer, with the events in Baton Rouge, St. Paul, Dallas, Orlando, Nice, etc. etc., so the idea is to remind people that there is a tremendous amount of good in the world. If you would like any of the promotional materials, please contact Suzanne Miller at liondogfarm@msn.com. Peace Village Newberg–the week-long summer day camp program which teaches conflict prevention and resolution skills to kids ages 6 to 13–was the focus of our program last week. 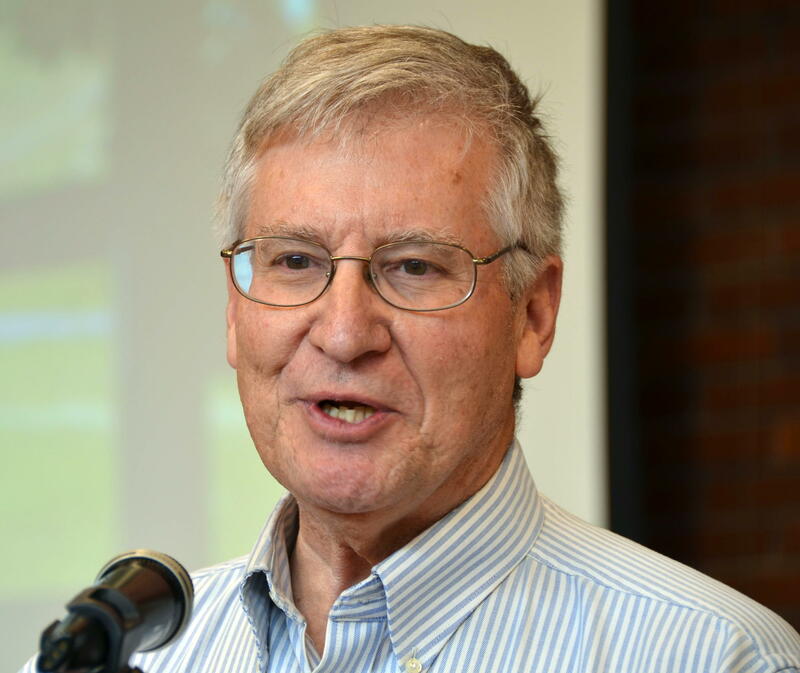 Dr. Scot Headley discusses Peace Village Newberg. 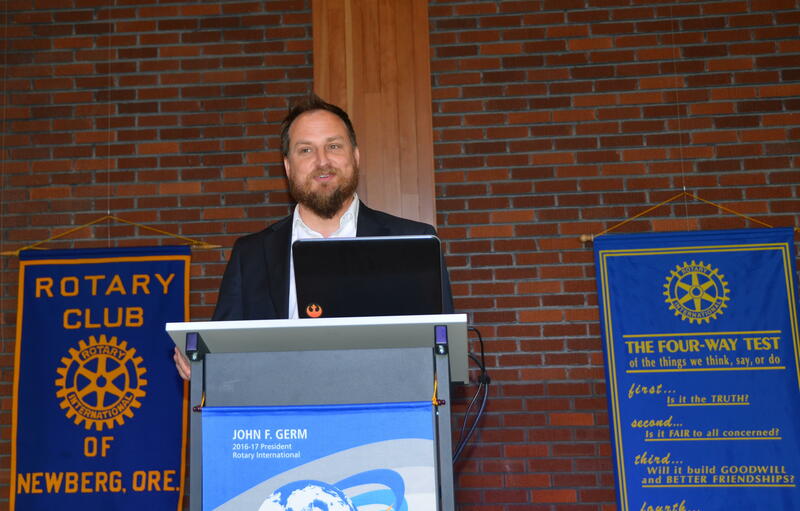 Dr. Scot Headley, the dean of education at George Fox University and the director of Peace Village Newberg, provided an overview of the camp and its activities. Now in its fourth year, Peace Village trained 48 children last July and had 30 adult and young adult volunteers. Peace Village gives kids a chance to interact with people who are different from them. “They learn that differences can be celebrated,” said Headley. The camp is held on the campus of North Valley Friends Church, roughly at the intersection of Bell Rd. and N. College St. It offers classrooms, walking trails, peace poles and a full-size labyrinth. The labyrinth and walking trails are definitely worth checking out if you have not been there. President Leah and Morning Club President Ron Wolfe. Visiting Rotarian and President of the Morning Club Ron Wolfe attended our meeting primarily to invite us to the “community service clubs joint barbecue” this coming Thursday evening. It’s set for 5 to 8pm at the home of Dr. David Krier in St. Paul. More info and you can RSVP via the website. If you’re not doing anything Thursday night, come join the fun. 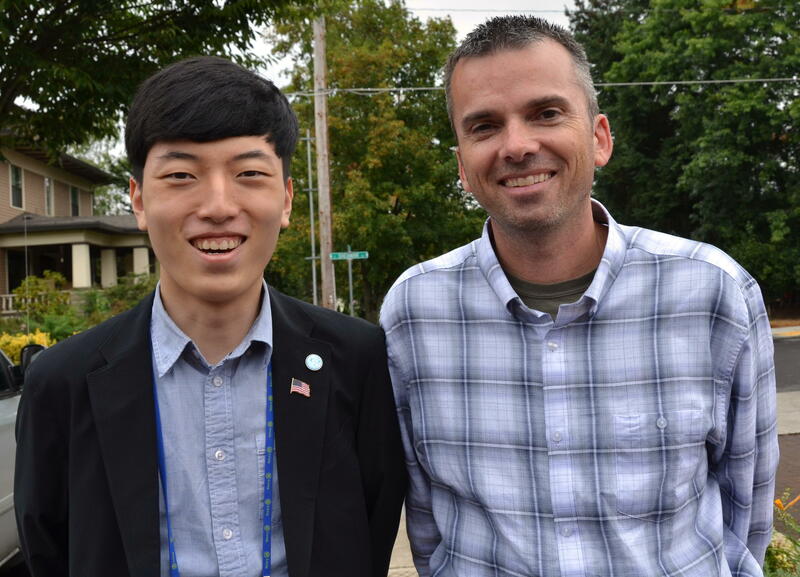 Other guests: Mike Pollock, Yamhill County director of Helping Hands, who is this close to being a member of our club, and Dan Keuler from the City of Newberg. Corey Zielsdorf introduced Jeong Hyean Choi, an exchange student from South Korea who will be staying with his family this year.